In our current understanding of molecular clouds, many molecules are created in fast ion-neutral reactions and destroyed in collisions with free electrons. The latter process, the Dissociatice electron Recombination (DR) of molecular ions leads to neutral particles. It is important to understand the DR rate coefficient and the product branching ratios in order to reliably model interstellar clouds. Heavy ion storage rings are formidable tools for collision studies with molecular ions. They are particularly useful for measurements of electron recombination rate coefficients. Ions can be stored at Mega-Electronvolt (MeV) energies for storage times ranging from seconds to minutes. During the storage time internal excited states can relax radiatively. 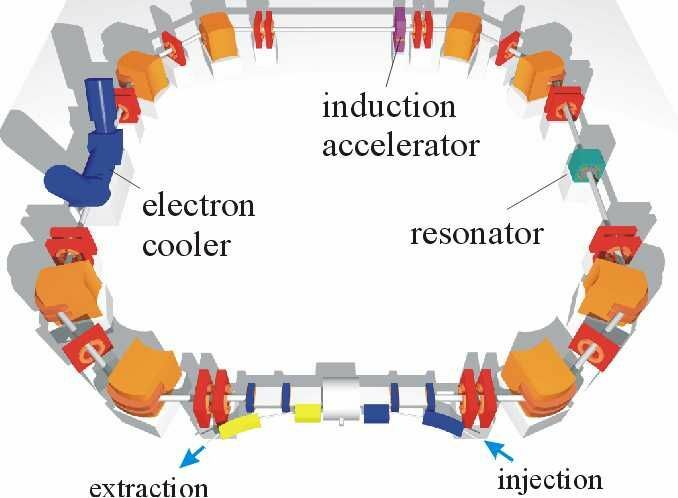 In one of the straight sections of the storage ring a cold electron beam can be superimposed for translational cooling and for electron recombination experiments. Schematic of the TSR storage ring at MPI-K Heidelberg. At the TSR storage ring (see figure) of the Max-Planck-Institut for Nuclear Physics we have carried out a comprehensive program to understand the DR of H3+. The H3+ ion is the sinlge most important molecular ion in interstellar clouds and the uncertainty in the DR rate coefficient had severe consequences for our understading of the abundance of H3+ and the cosmic ray ionization rate. At TSR we were able to perform rate coefficient measurements as well as imaging experiments that shed light on the internal excitation of the ions and the dissociation dynamics. Imaging measurements of the geometry after dissociative recombination (left panel) and the initial shape (right panel) of H3+ obtained at the TSR storage ring.